Join us for a teach-in on HB2281, the Arizona bill passed into law last year banning Ethnic Studies from public schools in the state. After the presentation we’ll be having an open discussion on representation in our own school curriculum. Come share your experiences with the Core and other classes at Columbia and Barnard. Free pizza! Come hear a panel discussion with Professor Gary Okihiro and former student activists who organized the ’96 (Jane Sung E Bai) and ’07 (Sam Stanton) hunger strikes for Ethnic Studies. Free food! This a great opportunity to celebrate the Native community at Columbia, connect with new and returning students, and learn more about the many opportunities and resources on campus. Buffet food will be served. Columbia University’s Native American Council hosted their first annual Pow Wow at Pupin Plaza. The day was full of dancing, great food, and a celebration of Native culture. It was a successful first Pow Wow! Columbia University may not have Columbus Day off, but that didn't stop students from protesting—and hitting the barbecue. Check it out at: drumsalongthehudson.org Lotus Music and Dance is hosting this Native festival this weekend at Inwood Hill Park, located at 218th St and Indian Road. This Eighth Annual event is being sponsored by Lotus in collaboration with the New York City Department of Parks & Recreation, the New York City Department of Cultural Affairs, WABC-TV, Councilman Robert Jackson, and JP Morgan Chase. 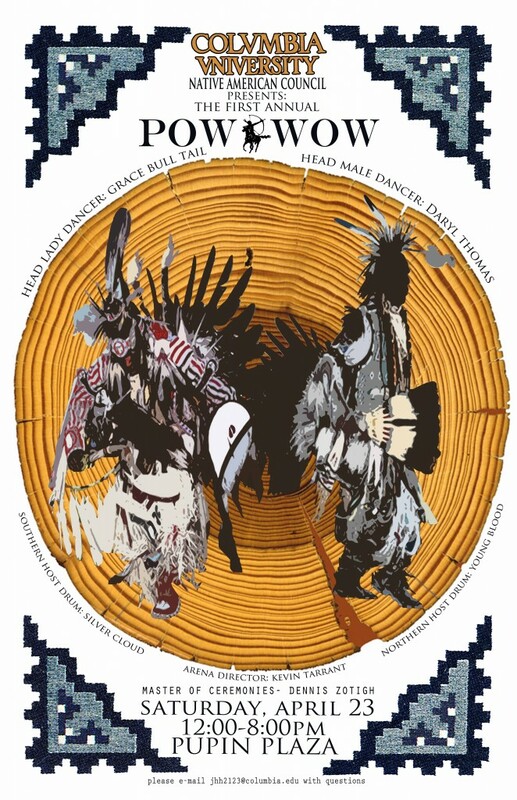 Its the only big outdoor Manhattan-based powwow, and its been going since 2002. If you’re around the city, and looking for something fun and exciting to do this Sunday (besides Summer move in; I know I’m feeling the pain right along with you), you should come out. Its an organization worth our support. I’ll definitely be headed uptown Sunday afternoon. All Ivy Native Council CONFERENCE at Yale coming up! April 3-5 Register online before March 20th for cheaper, early fee: http://spreadsheets.google.com/viewform?formkey=cGRLUERQUkRET0xiQnktM3dwVkdnWGc6MA.. we will be taking the metro north to new haven. Might get half of the cost reimbursed. Repatriating Native Alaskan Songs at Columbia University Wed, Nov 19, 8:30p – 9:30p Fayerweather 313 Currently, Columbia University owns over 120 Iñupiat songs gathered by Laura Bolton, an eminent folk music collector of the 20th century. Today, these songs are in the process of being returned to their communities of origin in Barrow, Alaska. Two Columbia Professors involved in the repatriation of the collection, Aaron Fox and Chie Sakakibara, will be sharing some of these songs, as well as presenting their knowledge on the joint project between Barrow, Alaska and Columbia and discussing the importance of considering intellectual property rights in repatriation policies. Snacks will be provided. Hey Everyone, Please be sure to read this letter sent by Sandy Grande. The Tecumseh Project is dedicated to advancing and expanding sovereignty and self-determination for Indigenous peoples both in the U.S. and internationally. 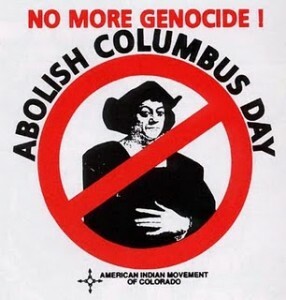 To this end, it is committed to building transcultural and transnational solidarities among Indigenous and other peoples working toward decolonization and the effort to develop a world free of exploitation. Background As the global Indigenous solidarity movement gains momentum, there has been, consequently, considerable turn over in Indigenous leadership. At the same time, the unprecedented involvement of Presidential nominee Barak Obama with Native American constituencies has had a ripple effect throughout Indian Country. These changes have sparked revitalization among several organizations and constituencies, creating a synchronicity of initiatives. • The passing of the United Nations Declaration of the Rights of Indigenous Peoples Clearly, this is an opportune moment to bridge visions and consolidate resources in a broader effort to promote Indigenous sovereignty and self-determination. There has long been a need for an organizational entity that helps to bridge the gap between scholarly research and public discourse as generated by the academic, activist, and policy-making sectors. Moreover, while there is wide interest in developing a Native Studies initiative in New York City (as demonstrated through the symposia of Native scholars held at Columbia University 2007-2008), the diversity of populations and interests renders traditional approaches incompatible. New York City, however, presents its own unique set of assets, most notably; it is the home of the largest, most diverse, and fastest growing urban Indian population in the United States as well as the home of numerous governmental and non-governmental institutions that work on behalf of Indigenous peoples including: The United Nations, the National Museum of the American Indian, the Hemispheric Institute (NYU), the American Indian Community House, and the Natural History Museum among others. Project Description The broad aim of the proposed Tecumseh Project would be to advance a more inclusive and robust public discourse on Native Americans in New York City as well as on the challenge of achieving intellectual and political sovereignty across Indigenous communities globally. In so doing, the Project aims to bring to the forefront Indigenous perspectives on democracy and human rights that have been marginalized or distorted within traditional venues, producing counter-narratives of sovereignty and self-determination. Efforts would be driven by a core of Indigenous and non-Indigenous scholars, activists, and community members committed to building transcultural and transnational solidarity among Indigenous peoples and others committed to reimagining a world free of myriad forms of exploitation. Toward this end, the Project would engage a range of issues, from education and public health to the arts and environmental science. • Red Pedagogy is a pedagogical project wherein pedagogy is understood as being inherently political, spiritual, and intellectual. • Red Pedagogy is informed by critical theories. A red pedagogy searches for ways it can both deepen and be deepened by engagement with critical and revolutionary theories of education and society. • Red pedagogy promotes an education for decolonization. The root metaphors of decolonization (equity, emancipation, sovereignty, and balance) help to define a pedagogy that makes no claim to political neutrality but rather engages a method of analysis and social inquiry that troubles the capitalist-imperialist aims of unfettered competition, accumulation, and exploitation. • Red Pedagogy is a project that interrogates the relationship between democracy and indigenous sovereignty. In this context sovereignty is broadly defined as “a peoples right to rebuild its demand to exist and present its gifts to the world…an adamant refusal to dissociate culture, identity, and power from the land ” (Lyons, 2000). • Red Pedagogy actively cultivates a praxis of collective agency. That is, it builds transcultural and transnational solidarities among indigenous peoples and others committed to reimagining a democratic/sovereign space free of imperialist, colonialist and capitalist exploitation. • Red Pedagogy is grounded in hope. That is, not the future centered hope of the Western imagination, but rather a hope that lives in deep contingency with the past – one that trusts the beliefs and understandings of our ancestors, the power of traditional knowledge, and the possibilities of new understandings.